Hypertension affects about 30% of adults worldwide. Among dietary factors salt has taken the brunt of the blame. But sugar may be the real culprit in high blood pressure. A meta-analysis of 12 trials in the The American Journal of Clinical Nutrition found that sugar intake over a period of two months or more could on average spike systolic blood pressure by 6.9 mmHg and diastolic blood pressure by 5.6 mmHg. One of the biggest problems is fructose in sodas. Just last year another analysis of six prospective cohort studies found those drinking the most sugar sweetened beverages increased the risk of hypertension by 12 percent compared to those who drank none. And with every additional serving of the sugared drinks risk shot up 8.2 percent. Children are particularly at risk. In a study of over 15,000 Iranian children and adolescents, those who drank over 90 ml per day (one-third of a serving) had a 2.74 fold increase in risk of hypertension. So when it comes to blood pressure, avoiding processed foods high in fructose is the first step to lowering risk. The next step is adding the right foods to your diet. Here are 19 foods proven to lower blood pressure. Many studies prove that cocoa products can lower blood pressure. In a German meta-analysis of 10 randomized controlled trials the mean drop in blood pressure was 4.5 mmHg for systolic pressure and 2.5 mmHg for diastolic pressure over 2 to 18 weeks. Dark chocolate is particularly effective. An Australian meta-analysis of 13 randomized studies concluded that dark chocolate is more effective than a placebo in lowering blood pressure. Among hypertensive or pre-hypertensive patients, eating chocolate dropped systolic pressure as much as 8.0 mmHg and diastolic pressure as much as 4.9 mmHg. And it doesn’t take much dark chocolate to make a difference. In a randomized, controlled study published in JAMA 44 patients with hypertension or pre-hypertension were given one small square of dark or white chocolate with just 30 calories. After 18 weeks the dark chocolate reduced mean systolic pressure by 2.9 mmHg and diastolic pressure by 1.9 mmHg. There were no changes in the white chocolate group. Researchers give credit to flavanols (primarily epicatechin) for the blood pressure lowering effects of chocolate. [i] In a study in the journal BMJ 21 volunteers were given either a high flavanol (701 mg) or low-flavanol (22 mg) cocoa beverage. After a 10-minute exercise session, mean blood pressure increases were 14 percent lower for those drinking the high-flavanol chocolate. A study in the American Journal of Clinical Nutrition found that chocolate also contains procyanidins that increase nitric oxide production and relax blood vessels. Chocolate also saves lives. A study of 470 elderly men in the Archives of Internal Medicine found that those eating the most chocolate didn’t just lower their blood pressure compared to those eating the least. Chocolate slashed the risk of cardiovascular death in half. The SUN Project is a prospective cohort study in Spain whose members are all university graduates. Data from 6,863 participants, with at least two years of follow-up, showed that among men, hypertension was up to 75 percent lower for those eating more olive oil compared to those eating the least. And in a randomized, single-blinded and placebo-controlled trial from the University of Massachusetts, 41 overweight or obese participants were asked to replace their regular dietary fat with either olive oil or a control mixture of corn, soybean oil and butter. After three months the olive oil group dropped their diastolic pressure by an average of 3 mmHg and systolic pressure by an average of 6 mmHg. Beets lower blood pressure significantly thanks to high levels of dietary nitrates. The British Heart Foundation funded a study of 68 patients with hypertension. Half the patients received 250 ml (about a cup) of beetroot juice or a placebo juice containing no nitrates. Blood pressure in the nitrate group dropped a mean amount of 8.1/3.8 mmHg. In addition, endothelial function improved by about 20 percent and arterial stiffness was reduced in the nitrate group but not in the placebo group. Another recent prospective study of 1546 non-hypertensive subjects, aged 20-70 years, collected data on the amount of nitrate-containing vegetables people ate every day. After three years those who ate the most nitrate-rich veggies cut the risk of hypertension by 37 percent compared to those who ate the least. Adding garlic to your diet can help reduce blood pressure. 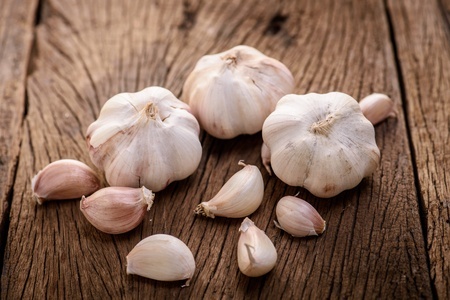 In a meta-analysis of seven randomized, placebo-controlled trials researchers found a significant blood pressure effect of garlic. On average systolic pressure dropped 6.71 mmHg and diastolic pressure dropped 4.79 mmHg. Garlic’s effects on blood pressure are dose dependent. An Australian study looked at 79 patients with uncontrolled systolic hypertension. Patients were divided in four groups and every day received either a placebo, or one, two, or four capsules of aged garlic extract (240, 480, or 960 mg per day). The dose of 2 capsules per day (480 mg) was most effective, lowering mean systolic blood pressure by 11.8 mmHg. In fact, garlic rivals blood pressure medications. In a study of 210 hypertensive patients, garlic tablets significantly reduced blood pressure compared to the drug atenolol. And unlike drugs, garlic is safe and well tolerated. Studies show that watermelon lowers blood pressure. A pilot study from The Florida State University gave 9 pre-hypertensive people six grams a day of the amino acid L-citrulline from watermelon extract. All of the patients showed improved arterial function and lower aortic blood pressure. 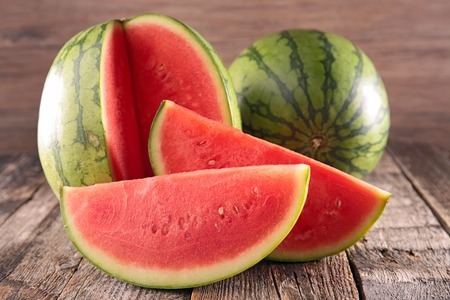 Because it is rich in potassium, watermelon also helps keep salt from raising blood pressure. It also contains lycopene, a powerful antioxidant associated with heart health, healthy arteries and blood flow. Other studies show that watermelon extract improves aortic blood pressure. In an Israeli study 101 kidney disease patients were randomized to receive 100 cc (a little over three ounces) of pomegranate juice or a placebo drink every day. After one year systolic blood pressure was significantly lower in the pomegranate juice group but not in the placebo group. Researchers concluded that drinking pomegranate juice regularly reduces systolic blood pressureand may reduce atherosclerosis. Another Israeli study found that one year of drinking pomegranate juice reduced systolic blood pressure by 12 percent. Studies also prove polyphenols in fruit juices have a positive impact on blood pressure. In one study drinking 400 ml (about 13 ounces) of chokeberry juice significantly lowered blood pressureafter just four weeks. A meta-analysis of 21 randomized controlled trial concluded that nuts lower blood pressure. 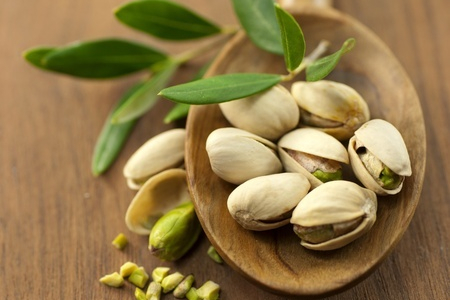 Pistachios had the strongest effect on reducing systolic and diastolic pressure. In a study from the West Indies hypertensive patients who drank coconut water had significant drops in blood pressure in just two weeks. Of those drinking coconut water, 71 percent had significant decreases in systolic pressure, and 29% had significant decreases in diastolic pressure. Flaxseeds contain omega-3 fats, lignans, and fiber that provide benefits to patients with cardiovascular disease. A meta-analysis of 11 studies found that eating flaxseed products reduced blood pressure. In one prospective, double-blinded, placebo-controlled, randomized trial, 110 patients consumed a variety of foods that contained 30 grams of milled flaxseed or placebo each day. After six months systolic pressure went down about 10 mmHg and diastolic pressure dropped about 7 mmHg in the flaxseed group. The effect was even greater in patients with systolic pressure above 140 mmHg at the start of the study. Researchers concluded that flaxseed induced one of the most potent antihypertensive effects achieved by a dietary intervention. Diets rich in fiber may lower blood pressure. In one study published in the American Journal ofClinical Nutrition, people eating three portions of whole-grain foods per day decreased their systolic pressure by 6 mmHg and diastolic pressure by 3 mmHg after just 12 weeks. Researchers estimated that the blood pressure improvement from whole grains could decrease the incidence of coronary artery disease by more than 15 percent and stroke by more than 25 percent. In a study of 50 hypertensive patients in India, switching to sesame oil for 45 days brought blood pressure levels back to normal. And when patients stopped using sesame oil their blood pressure returned to their higher levels in 45 days. Another study from Greece found that using 35 grams per day of sesame oil decreased systolic blood pressure in just 15 days. It decreased central and peripheral diastolic pressures in just one hour following meals. In a double-blind randomized controlled trial 60 diabetic patients were assigned to drink two cups of hibiscus tea or black tea a day. 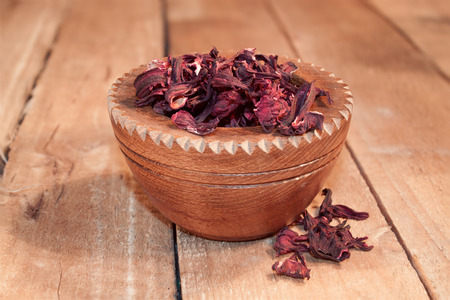 After 30 days the hibiscus tea lowered systolic pressure by a mean of 22 mmHg and pulse pressure by 18 mmHg. Black tea drinkers saw their pressure increase. Many other studies prove the power of fruits and vegetables to improve vascular function as well as to lower blood pressure. Researchers credit phytochemicals and potassium among other things for the hypertensive benefits of fruits and vegetables. A Harvard analysis of data from more than 180,000 people in the two Nurses’ Health Studies and the Health Professionals Follow-up Study compared people who ate four or fewer servings of fruits and vegetables a week with those who ate four or more servings a day. People eating more whole fruits were eight percent less likely to develop hypertension. Those who ate more vegetables were five percent less likely to have high blood pressure. Spices can also regulate blood pressure. In a British study of diabetics, taking two grams of cinnamon significantly reduced blood pressurein just 12 week. In a study from India, patients with stage one hypertension were given three grams of cardamom powder a day in two divided doses. After 12 weeks the cardamom significantly lowered both systolic and diastolic blood pressure. Researchers also reported that all of the patients experienced a feeling of well-being without any side-effects. 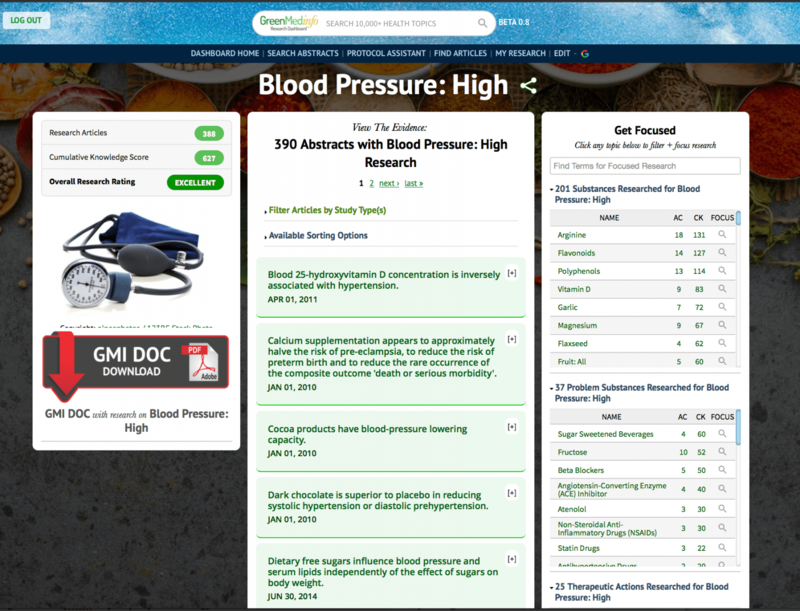 To learn more about natural and/or integrative approaches to blood pressure concerns use our database on the topic: High Blood Pressure research.